I have another finished knit!! I feel like i have accomplished so much when i see all the knitted things lying around, even if they were finished in a few days. 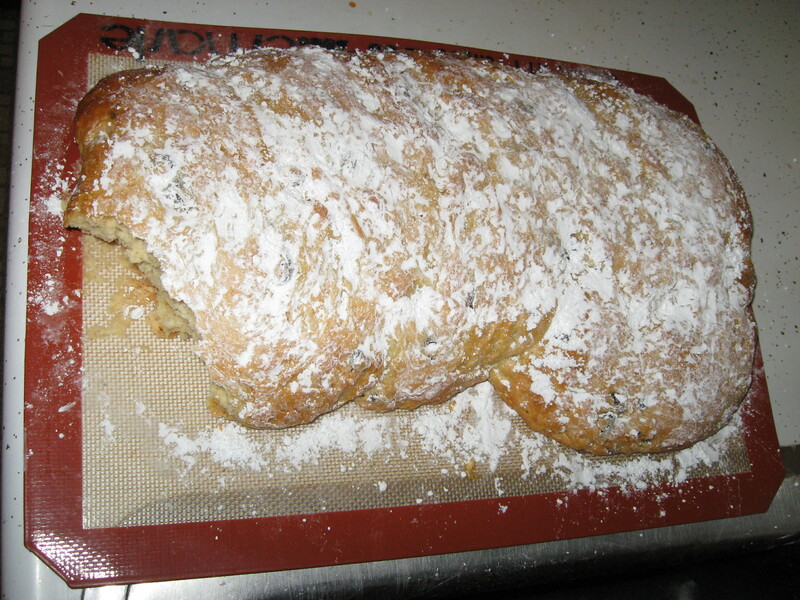 But first my attempt at a sweet bread with Little Man. We made it yesterday and well….it was interesting. First he mixed the dry ingredients for me and then i added the wet while he was mixing. The batter was way dry. Then i realized that i still had the milk on the counter and it wasn’t in the list of things to add to the dry so i tossed it in. Much better. We Kneaded and punched and rolled and Little Man did some by himself while i rinsed out a big bowl to put the bread dough in for rising. I set the bowl in front of the heater vent because we keep our house comfortably cool. About 5 mins later i realized I FORGOT THE SUGAR-CRAP!! Instead of just leaving the bread alone i decided to try to knead the sugar in because no-one would want to eat tasteless raisin bread. Oh boy, not the best idea, At All! Obviously i was having some trouble so i thought if i added some liquid it would be easier to mix in the sugar. It did help but then i ended up with super sticky dough and bread dough is not sticky, so i added more flour. I never got the dough totally unstuck but i was afraid to add too much flour so i quit and left it to rise. At this point Little Man lay down for his nap. It did rise but it took forever and looked even STICKIER. How can that be possible??? It was stickier! Well once it has risen you are supposed to divide the dough into 3, roll and make a big braid. More flour came out, LOL, there would have been no way i could have rolled the dough in the condition it was in. I managed a really ugly, blobby and sticky braid. Again rise-at this point i was tired of waiting for my dough to rise so after an hour i stuck it in the oven. About 30 mins later it was done. I let it cool and sprinkled, well okay dumped and rubbed powdered sugar over it. I took a bite…not bad…it was sweet…tasted like how i thought it should…but it’s a lot denser than i wanted and a bit chewy. I wanted lofty. It was a learning experience. All in all i am happy with the turnout. Here it is! On to the the FO. My Sunflower Tam. Yarn: Cascade 220 Heathers, took pic outside so it is a very good shot of the color of the yarn. I love the top of this, which is the main reason i made it-it looks a bit goofy on but i am sucking it up and wearing it anyway!! i always think hats look goofy on me. I followed the pattern as written. The fit is good. Some of the decreases were a bit tricky with my stubby Clover dps, so use some pointy dps if you ever decide to make this. Next up-finish My So-Called Scarf and the sleeve and a half on my cardigan-I must make myself finish it. Little Man is at Grandma’s tonight. He doesn’t know but tomorrow we are making chocolate chip cookies, pizza (loves decorating the pizza) and having a movie date. My mom gave me a coupon good for free movies, popcorn and pop. I can’t wait. Sunday, raking and jumping into leaves 🙂 Even more fun. Hope you all have a Fun weekend too!! Your sunflower tam is lovely! I love Cascade 220. Have you checked out http://www.kingarthurflour.com/ They have recipes, a store (which I’ve visited in person and it is baking heaven on earth!!) and great tips for baking. Yes sunflower is looking really nice! And it sounds like you have a great weekend going on! Great hat! 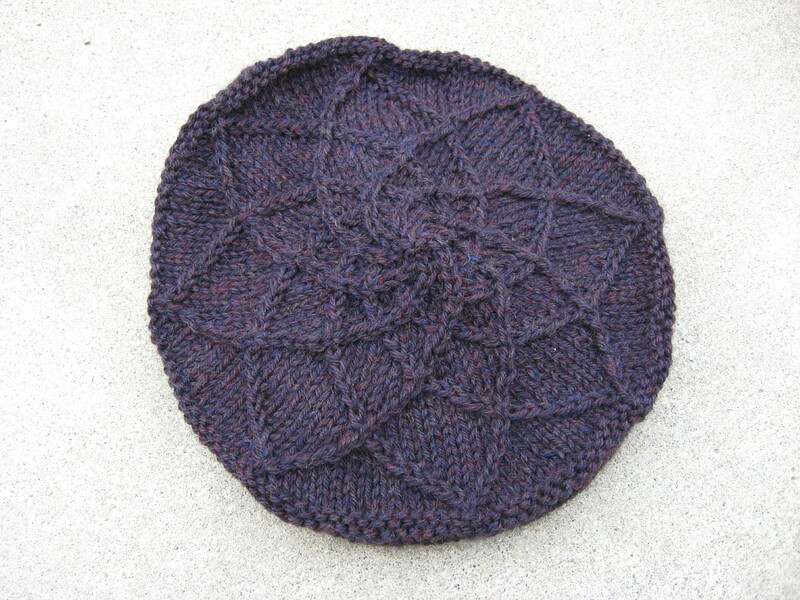 I’m starting to be a bit of a hat lady, maybe I should knit this one, too, lovely pattern. Your bread has a nice shape, like a lazy hippopotamus! *^v^* But you are right – adding additional water was not a good idea, good kneading is a solution for a light spongy bread. But I’m glad it tasted good! Have a great weekend, it seems to be full of good food and fun activities!